Arizona Landlord Tenant Blog: Can a tenant get out of a lease before the end of the lease if the tenant must (or elects) to move out of Arizona? Maybe. 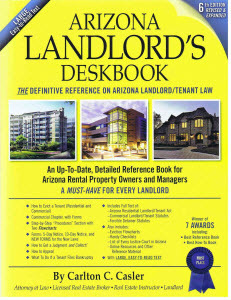 The tenant is bound by an Arizona lease until the termination date, but the lease may have a “buy out” provision (also known as a liquidated damages provision), whereby the tenant pays the landlord a specified amount and the landlord lets the tenant terminate the lease early. It is also possible (although highly unlikely) that a lease may include a provision that allows the tenant to terminate the lease if the tenant moves out-of-state, gets a new job, etc., but that is normally a provision that the landlord would have had to add to the lease form. Assuming none of the foregoing apply, then the tenant can talk to the landlord about a “mutual termination,” whereby the tenant and the landlord sign a document terminating the lease in exchange for something (normally payment of money by the tenant to the landlord). If the lease does not have one of the foregoing provisions and the landlord does not wish to agree to a mutual termination, then the tenant is financially responsible for rent until the end of the lease term. If the tenant vacates sooner than that, then the tenant is obligated for all rent, late fees, and any other amounts that accrue under the lease, plus expenses incurred by the landlord to re-rent the rental unit, but less any rent the landlord collects from a new tenant before the end of the lease term. If the tenant does not pay the foregoing amounts and the landlord files a civil lawsuit, then the tenant may also be financially responsible for the landlord’s attorney’s fees and court costs.